m8 I didn’t have him saved in my folder of mugs for SoA. Accursed FE8 and their forced use of the world map. It’s good, lol. Hands make almost every portrait better. Portraits are a marked improvement. Kudos. By the way, I’m late asking this, but do you want some graphical/music/mapping/everything quality-assurance? I know you already have quite a few team members, but I’ve been meaning to offer help on projects that I like more often. I know it seems like the team is big (writing and art especially), but some of those people might’ve only done one or two things, or did some stuff but got busy with IRL stuff, so the number of totally active team members is probably less than whomever is up there. Should we send him an invitation for the discord chat? I probably won’t be active on Discord, but invite me to all the chats anyway. Those are always where the real activity’s at. I’ll hit you up on Skype. 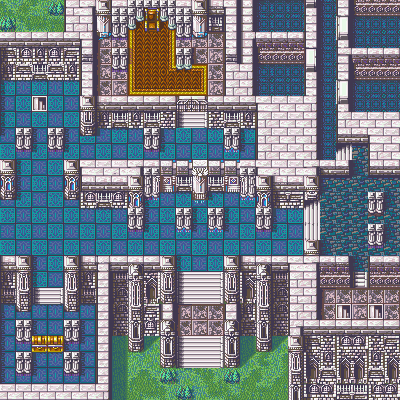 and an improved Ch12 map thanks to @Alusq! I’m gonna throw this here because I’m “done” with the demo. Is Belle going to get a unique promotion? Are the titles too long for FE8 to read or for FEditor to insert? Except the stuff after chapter 1. Still don’t know what I’m doing for that.